Credit card spending by South Koreans last year rose 6.6 percent from the previous year to record-high of 810.7 trillion won ($725 billion), although average payment per purchase decreased, data showed Friday. 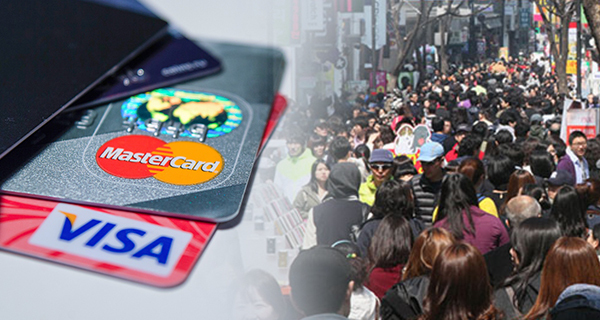 According to data released by the Credit Finance Association, South Koreans’ credit card spending exceeded 800 trillion won last year in just two years since the figure first surpassed 700 trillion won in 2016. Credit card transactions increased 10.8 percent from 2017 to 19.83 billion, slower than the on-year growth rate of 13.4 percent in 2017. The government’s tax cuts to stimulate domestic spending played a major role in boosting the credit card spending last year, according to industry experts. The government in July lowered individual consumption tax on passenger car purchases from 5 percent to 3.5 percent, which will remain in effect until June 2019. It also cut fuel tax on gasoline, diesel and liquefied petroleum gas (LPG) by 15 percent in November last year. However, the average credit card payment per purchase decreased 3.8 percent on year to 40,886 won despite the steady rise in the entire credit card spending. This is mainly because Korean consumers carry around less cash and increasingly make small purchases with credit card, according to an official from the association.